Happy Grind Monday! 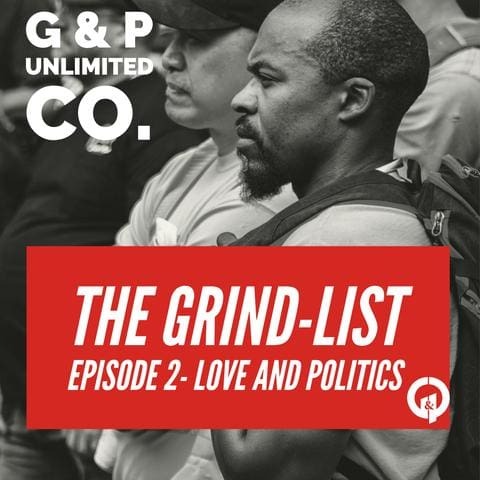 Each week G & P Unlimited Co. will share 10 songs from our weekly musical Grind-List that help shape our company's culture. You might not know this but the letter "G" stands for Grind/Get-Up and the letter "P" stands for Pursue in G & P. So when you wear and support our brand you are Grinding or Getting up to Pursue an Unlimited Lifestyle. So this week Grind-List is called Love and Politics! Please continue to pray for those who are affected by the governmental shutdown. I hope you Enjoy! Have an amazing week! Live Life-Be Unlimited -Become Legendary! Please Share, Provide Comments, and Suggest Tracks.